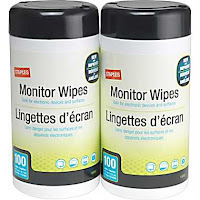 Hurry over to Staples where you can score a 2-pack of Staples Monitor Wipes for only $4.99! These regularly cost $14.99 and you can choose from several different free shipping options. You can order online and pick up in-store for free or sign up for their Rewards Program to not only score FREE shipping, but also 5% back! OR, you can get free shipping if you spend $50+.